Mooring whips are flexible fiberglass poles used to hold a boat off a dock to prevent damage to the boat or dock. Also known as boat whips or dock whips, they were originally designed to counter the effect of changing tides, boat wakes, and wind driven waves. Mooring whips use tension to hold the boat at a safe distance from the dock and their flexibility allows some movement of the boat due to tidal changes. Boat whips have a number of applications in the docking industry, but are generally used for smaller boats. Mooring whips were a major innovation for boat docking systems and these boat whips have been a fixture in the boat docking industry for over half a century. How Do Mooring Whips Work? Mooring whips are mechanically fastened at one end to the dock while the opposite end is connected to a cleat on the boat via a dock line. When a boat whip is tied to the boat cleat it causes the fiberglass pole to bend, and will keep separation between the two. Dock whips are often used in conjunction with bumpers, fenders, and marine grade lines to ensure the safety of the boat. Do Mooring Whips (Boat Whips) Work? Mooring whips have been in use for over half a century and are most effective for small boats and in calmer waters. Boat whips are composed of fiberglass, which gives them their flexibility, however, the fiberglass can fail and has a relatively short lifespan when compared to alternative systems. 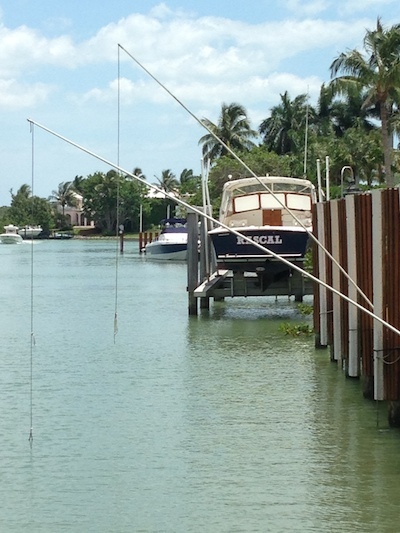 In high tides mooring whips are least effective because there is no tension on the pole, which allows enough slack for the boat to hit the dock. Alternatively, in low tides the boat whips will experience a tremendous amount of stress that will greatly increase their potential to fail, leaving your boat unprotected. Fractured fiberglass poses serious injury risk. Because mooring whips keep your boat away from the dock, boarding and loading can become difficult and unsafe. Dock whips can work well, especially in calm waters, but next-generation boat mooring systems such as the The SlideMoor System provide a less expensive option that is safer for you, your boat, and its passengers. Is There a Better Mooring System Than Using Boat Whips? Yes! The SlideMoor System is the next stage in the evolution of docking systems. SlideMoor takes the guesswork out of tying up your boat, solving many of the docking and mooring issues encountered by boaters. SlideMoor works much the same as a floating dock. It secures your boat tight with two lines on one side only, eliminating bumping, banging, and other damaging movements. SlideMoor allows your boat to move securely up and down through waves, wind, and tides. Want more information about the SlideMoor System? Check out The SlideMoor System section of our site, complete with a benefits section and photo gallery. You can also contact us via our contact us form or give us a call at 239-263-7044. If you are a dealer and are interested to learn more, use the dealer contact form.